Apple Inc. (AAPL) is challenging the current year high at $644 area today. A review of its daily chart is in order to give us a proper perspective on what to look for in the coming months. After all, AAPL is the main driver of the two major stock market indices, S&P 500 and Nasdaq 100. Where AAPL is heading will greatly affect the performance of the index ETFs SPY and QQQ as well. Following is a chart of daily AAPL, QQQ and SPY. I have marked the beginning of year 2012 with a dark red vertical line so that everyone can see where all three symbols started this year. Notice that AAPL as a component of SPY and QQQ is a major driver for the gain in these ETFs in the first half of this year. As of this point in time, AAPL has become even more important as majority of the components in both S&P 500 and Nasdaq 100 are not performing. 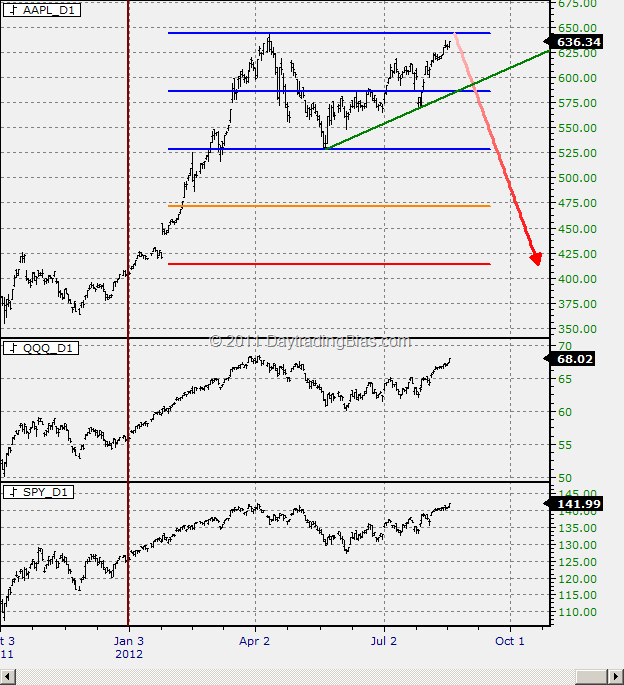 This is clearly shown in the chart since July that every push higher in AAPL has pulled SPY and QQQ higher. Avid chart readers would recognize that this chart is not projecting a bullish scenario for both AAPL and SPY. 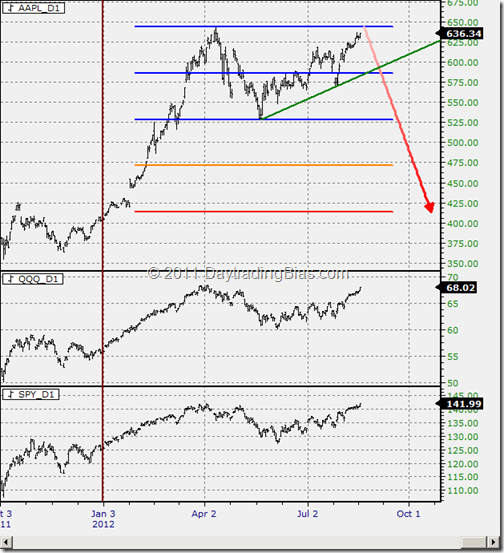 Should AAPL failed to clear the current year high area by 5% (5% from $644 is approx. $676) or more, it is at risk of forming a double top, or, a false breakout against the current year high. Both cases point to a move towards the other extreme which is the swing low formed back in May. If AAPL is indeed dropping towards the swing low formed back in May, the weaknesses can induce a flush to reach the double top downside target of low 400s (the horizontal red line). The interesting part of this is that the price pattern based target is matching the price discover target of testing previous year high / close area. So how do we know that the bull party is over for AAPL? Focus on the green support trend line. Once the price of AAPL has moved below the green line and failing to close above that by the end of a week, it is a signal that AAPL will have difficulties moving higher. At best, it will spend months consolidating in the current price range. If the bearish scenario on AAPL started to unfold, both SPY and QQQ will not be able to sustain themselves at the current price levels. That is the problem with a market that only a handful of stocks are driving the indices higher for a long time. As majority of money in the market is piled into those leaders, just a little downside pressure in those names can induce massive exodus effect on the indices. In short, both SPY and QQQ can drop much faster than the way they are rising so far. Projecting conservatively, both SPY and QQQ could move down to their respective opening price levels of the year when AAPL moves towards its swing low formed in May. If AAPL breaks that low, both SPY and QQQ can easily go negative for the year. The risk reward outlook for the indices are just not good from this point onward. Until AAPL has corrected its price, or, absorbed this bearishness through consolidation, there is not much upside holding onto long positions in the index ETFs. Apple topped right below the 5% mark.